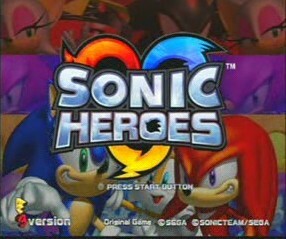 Sonic Heroes E3 version for the Xbox was the first public demo of Sonic Heroes, displayed during E3 2003. The title screen is very different from final. The loading screen with the 3 rings is used throughout the demo and is even used in place of the Title Cards. Only team Sonic is available, and a mere two stages (Seaside Hill and Rail Canyon) are playable. There are subtle differences in the object layout placed in each level. There are no level ups. When passing a checkpoint you'll receive an item. For example, if you pass the gate with Sonic, you'll get Speed Boots. If you pass with Knuckles you'll get a shield. There is no spoken dialogue and the hints given are simply text with a blue backdrop. The camera for the end level cutscene goes all wonky at the end of the level, panning away from Team Sonic. After beating the level a "Coming Soon" screen appears and then the game resets.